If you’re looking to add some adventure to your next Taco Tuesday, Mole Chicken with its combination of peppers and cocoa is a delicious choice. If you’re worried that adding cocoa to the recipe will make your dinner taste more like dessert, don’t fret. It helps give the mole its nice dark color and adds depth of flavor without making the dish taste like chocolate. Chicken Mole is a wonderful way to turn something simple (chicken) into something amazing. In addition, we also love to use it when meal prepping to have a base for multiple meals ready to go! First, there’s no denying it is delicious on its own with a side of rice and black beans. But make sure you don’t forget the chips and salsa! A favorite way to eat Chicken Mole is shredded and on tacos. Use your favorite toppings like cilantro, lime, guacamole, or shredded cheese. 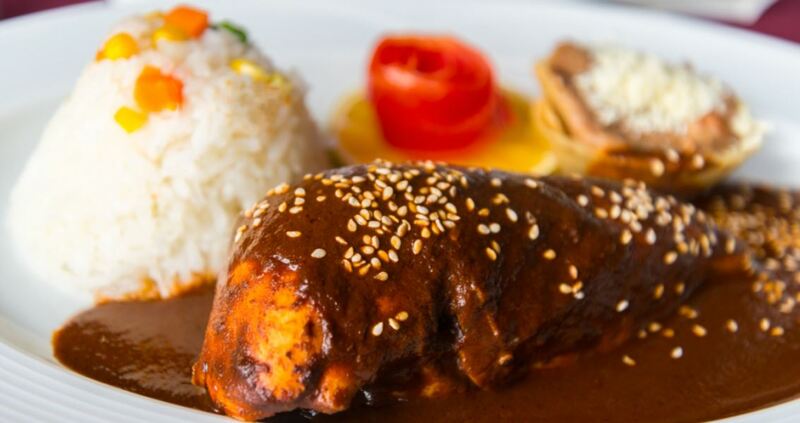 Another option we love is Mole Chicken Enchiladas. The uniqueness from the Mole makes this familiar recipe that much better! 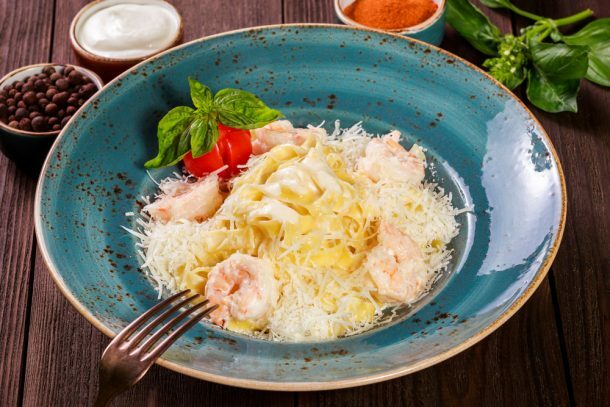 You can even make this meal ahead to save time on a busy night. Just make the Mole sauce, get some tortillas, cheese, onions, and avocados- then you’re good to go! Lastly, Mole Nachos topped with your favorites- black beans, jalapenos, onions, tomatoes, sour cream, shredded cheese, and guacamole. How long does Mole Chicken last? You can make Mole Chicken up to 3 days in advance to let the flavors blend together more. In the fridge, it can last up to 1-2 weeks. In the freezer, Mole Chicken can last for months. It’s great for a quick freezer meal in the future. You can even double to recipe and portion it out to have more meals prepared! First, in a large skillet, sauté onion in oil for approximately 10 minutes or until golden brown. Then, using a *mortar with a pestle crush coriander seeds and aniseed. Next, stir them into the onions and add chili powder, cinnamon, cloves, and agave. Cook over moderate heat, stirring for 1 minute. Stir in cocoa powder, peanut butter, chicken broth, crushed tomatoes, raisins, garlic, and salt. Simmer sauce, uncovered, stirring occasionally, for about 20 minutes. Flip the breasts and broil them for another 10 minutes. In a blender, purée the sauce (in batches, if necessary). Finally, transfer sauce to skillet, add chicken and simmer, uncovered, for 30 minutes. Serve chicken with the mole sauce with a side of rice and grilled veggies. *You can use a coffee grinder, rolling pin, blender, or spice grinder in place of a mortar and pestle.